Enriched Wheat Flour (wheat Flour, Niacin, Reduced Iron, Thiamine Mononitrate, Riboflavin, Folic Acid), Vegetable Oil (contains One Or More Of The Following: Canola, Cottonseed, Palm) Preserved By Tbhq, Salt, Dehydrated Vegetables (carrot, Green Peas, Garlic), Contains Less Than 2% Of: Maltodextrin, Monosodium Glutamate, Freeze Dried Shrimp, Hydrolyzed Corn, Wheat And Soy Protein, Sugar, Yeast Extract, Dehydrated Soy Sauce (wheat, Soybeans, Salt), Spices, Caramel Color, Potassium Carbonate, Sodium (mono, Hexameta, And/or Tripoly) Phosphate, Sesame Oil, Sodium Carbonate, Natural Flavors, Disodium Inosinate, Disodium Guanylate, Chicken Broth, Soya Lecithin, Lactose, Turmeric. Caution: Hot! Handle With Care Especially When Serving Children. Do Not Microwave. 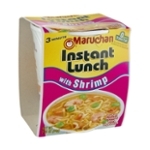 Contains: Wheat, Soy, Shrimp And Milk Ingredients. Manufactured In A Facility That Also Processes Shellfish And Fish Products.